In some cases, Yahoo Mail may accidentally filter a legitimate email as junk mail, and move it to the Spam folder; this can happen for any number of reasons, which we won't cover in this tutorial. We'll instead directly show you how to mark a "non-junk-mail" email as safe, first by marking the email as "Not Spam", and then simply by adding its sender to your contact list (the Yahoo Mail address book), since emails from contacts will not be filtered as junk in the future. You will also learn about the not-so-uncommon case where you mistakenly mark as spam a legitimate email, and what to do about it. There are two ways emails will not be filtered as junk mail (and moved to the Spam folder) by Yahoo Mail: emails from your contacts, and emails you have previously marked as safe. As discussed in our Spam and junk mail handling in Yahoo Mail tutorial, these cases are fortunately rare, and since Yahoo's junk mail filters are "adaptive" (they learn), you do not need to mark as safe a sender multiple times: once does it. Since junk mail deleted from inside the Spam folder does not go to the Trash folder like regular emails (they are immediately, and permanently, removed from your account), pay close attention to these emails before you delete them - especially if (for example) you are waiting to receive an email from a person who has never emailed you in the past. If you see a legitimate inside the Spam folder, right-click on it, and choose "This is not Spam" from the context menu (see screenshot). The email will automatically be moved to the inbox, and this sender's emails will from now on no longer be filtered as junk mail. Use whichever way you prefer, both methods amount to the same result: email moved from the Spam folder back to your inbox, and the sender added as safe sender. This happens to all of us: we accidentally mark as junk a legitimate email, which Yahoo Mail then moves to the Spam folder. No worries, though: all you need to do is go inside the Spam folder, locate the email, and manually mark it as not Spam. An isolated spam report will not cause problems to the email sender, unless many users report his/her email address as junk mail. As mentioned earlier, emails from your contacts will not be filtered as junk mail: so, by adding a sender, whose email was accidentally filtered as spam, as a contact in your Yahoo Mail address book, you are guaranteeing that his or her emails will from thereon always remain inside your inbox. 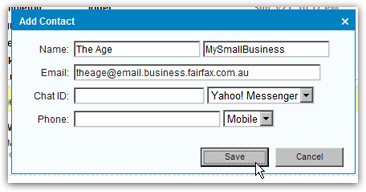 To add a person as a contact, right-click on one if their emails, and choose "" from the context menu. In the "Add Contact" popup, click Save. From then on, this contact's emails will not be filtered as spam; don't forget to move this new contact's from the Spam folder back to the inbox - and you are done!